Last chance for PIB's sales, stay warm in your living room tonight and try out PIB's furntiure and decorative accessories ! You will notice that the new products are already available at PIB, starting wih the selection that I have carefully advised below. VintagePendant lights, a old gangster's film couch, a super useful bookshelf, and two new sizes of PIB's two best-sellers: the workshop console and the workshop stepladder. Loyal to PIB's style, these furniture and lightings will bring a great vintage touch to your interior. The shiny interior of this pendant light gives a great visual effect thanks to its different kind of reflections. Designed with glass, it is covered with grey blue on the low part and smoked on the higher side. Il se dégage de ce canapé deux places une grande élégance rétro. Vous apprécierez le confort de son assise épaisse rembourrée de plumes, et d'un dossier capitoné style chesterfield. These wall-mounted metal cage shelves will look good ins all the room of the home, adding a touch of retro industrial design, which never goes out of fashion, thanks to its distressed grey pain finish. Practical, it can be used to add storing place without using to many place. Either used to access to highly stored stuff, or used as a few shelves, this stepladder will give a charming loft atmosphere to your interior. Its steel structure and varnished wooden steps guarantee the robustness of this furniture. Its black color and high shape give to this lighting a typical loft spirit touch. White inside. Ideally set over a table, or to elighten an entire room if it is fixed on a high ceiling. Larger version of the Pharmacy console, this piece of furniture is entirely designed with ancient wood. It will easily fit in an entrance, dining room or on either side of your sofa in the living room. 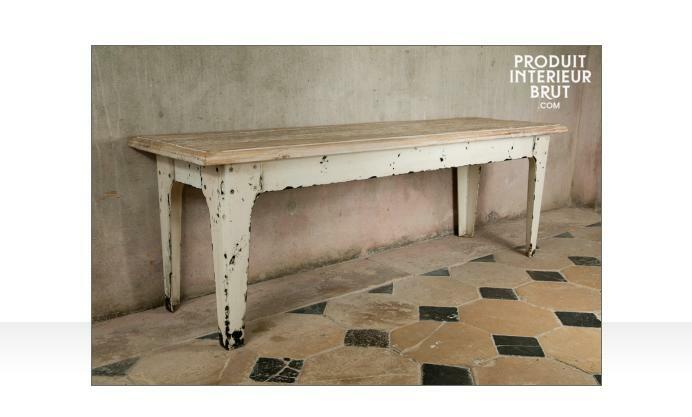 Inspired by working places furniture of the 1920s, this console is particularly neatly finished.